All general messages should be posted at the forum. I still accept all messages but am occasionally swamped and can't reply as quickly as one of the moderators. I may edit comments for brevity and clarity. I am happy to respect anonymity if requested. 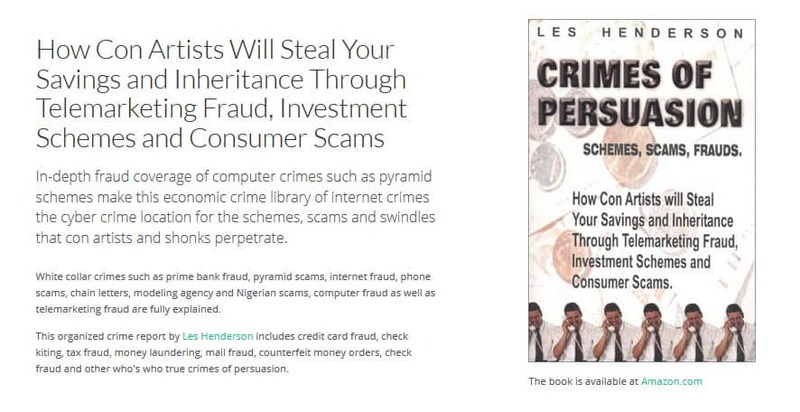 Variations on the Nigerian Scam submitted by viewers. A friend got me involved in this company called Circle Round the World, LLC (started July, 2001) located in Odessa Texas. They just moved to Dallas, restructured their company and are now calling it Texas Gold Rush. They have a web site: www.Texasgoldrush.com and phone conferences where you can listen in to company updates. Circle was apparently a starter company dealing with prepaid phone cards that didn't work in Canada. Texas Gold Rush deals with 1/10 of an ounce gold coins; and works on a 2x3 matrix. You join for $145, get two other people to join and so on and so on until your downline is 14 or 16. The computer fills in under you and you start cycling upline. The recruiting is being termed "sponsoring". This is a very "hands-on" company in that everyone helps everyone else. They have another company that does referrals for either $25 or $5 a month. The $25 one actually puts a qualifier under you or for $5/month, they give you a name and phone number and you do your own selling. The company was founded and run by this woman, Beverly Skinner, who is lining up all these other companies, ten in all. They are saying the Texas Cattleman's Association is involved, among others, and that the company has been approved by the Texas Attorney General and has a valid tax ID #. Is this legal and who do I contact to find out if it is or isn't? May I ask if you know of this man and is there any way that I can check out the validity of this scheme? If it is genuine then it has to be the best investment you can imagine. The brochure, if that is what it can be called, is composed of about 20 pages of A4 sheets describing first how he can trade for you and second, how you can trade for yourself in various countries. There is general information about traveling and how to trade. This is wrapped within a black shiny cover made of card. At the back are sheets for filling out when you send money to him. He quotes the net monthly profit each month for $500, $1500, $2500, $5000. For $5000 invested he purports to return $6750 or a profit of 35%. This is simply not possible for I have traded like this in India and there is no way you could get more than a few percent profit. Is there any way that this can be stopped before people send in their hard earned cash? It is almost certainly a scam that you have encountered. Either they simply keep your money or prove that the process works by issuing Ponzi payments. Any spread in currency exchange rates is usually entirely in favor of the banks. The process he describes is almost the same as what Charles Ponzi said about stamps. It went down like this, which is sadly obvious now that it's happened. I sent a Western Union payment to a guy who gave the usual info needed, even a phone # !!! He said he preferred Q&A ( question and answer verification - no ID required ) to pick it up, as he was working and would send his girlfriend, so I.D. would not be good. Now he has my money and I have only the following info. 2.That phone #, a FIDO prepay card-based phone which he gave FALSE info for. 3. His email is a non personal one, and likely sent from a library or something. Basically no name, number or email links to him. Who even picked up the money wire??? Can I get the video from western union, or will that even help, are the authorities that helpful, even if how would I know/identify him/her if they had no past records? See section on Internet Auction Fraud. This guy uses a different name every time. He posts to the tech support newsgroups offering free software via download. He requires a credit card number for "membership", and you know the rest. Please post his URL on your credit card fraud page. Thank you for your site. Download Retail Software Free! Super Gift for You! Would you like to have the Best Retail Software in the World for just about Free? Now you can! We make dreams come true by enabling you to get all the Popular Brand Name Retail Software you always wanted for Free! This supposed consumer protection site mentions that one should be wary of companies that do not offer a physical address or phone number yet all they have for contact themselves is an email address. They offer a FREE 45 day trial period to become a member but you are still asked for your credit card details, regarding which they make the statement that you will be billed after the 45 day period. There seems to be no option for mailing a registration payment either. We felt it was worth having you take a look. I will let viewers decide. I was severely burned by Trans-National Securities and Trust S.A. operating in Zurich (in the same building as Credit Suisse). I did my checks and references, but was still caught. Do you know anything about them, or any former clients I can contact? I am trying to get my money back. Any help gratefully received. I was unable to find anything but ask that victims contact me so I can get you all together somehow, if possible. I don't post email addresses of victims because recovery scam operators would surely take advantage of it. I am writing to you in regard to a phone fraud perpetrated against my mother which involves the so-called recovery of funds promised by a former Quebec-based boiler room phone fraud operation. An observant webmaster sent along a request to expose some medical quackery which he feels endangers children. In agreement, I provide some excerpts and the contact. "drops which stimulate the body to be ready for all the childhood illnesses They simply spray the drops in their child's mouth every six months. They do not believe that it is wise to give their kids regular immunizations ( measles, etc. ) because of the serious side effects and reactions, and the mercury preservative in the shots." I live in Victorville, a small town in the High Desert of Southern, CA. When my cat went missing, I placed an ad in the local newspapers, and several big color posters around the immediate neighborhood at major inlet/outlet intersections, the closest grocery store, and the local PetSmart. Of course I visited the two area shelters and called several veterinarians, my own and a couple of the 24-hour vet hospitals. One day I received a collect call ( we're researching the point of origin of the call ) from someone who claimed to be movers who were now in Missouri, and they said they found a cat in their van. Greg and Amy Jennings are wondering if the following lottery operation is a scam. I couldn't track down any specifics so would appreciate hearing back from anyone with more info. If you have any information on these people please let me know so that we can stop my father from sending any more money for a lottery that they say he has won. We just need to know if this is a scam or if it is for real. Firstly, I must compliment your extensive work on the web-site. This is just a short message in hope of some advice. This WEW craze is booming in the city of Glasgow, Scotland at the moment. WE GOT A REGISTRATION FORM FROM ( ILC ) EL GORDO ( the Fat One ) THAT SAYS YOU CAN WIN 960 MILLION. THIS CAME FROM AUSTRALIA AND IT LOOKED REAL ENOUGH , THOUGH IT WAS MY GIRLFRIEND WHO WANTED TO DO IT. SO EVEN THOUGH I TOLD HER SHE COULD BE RIPPED OFF SHE THOUGHT IT LOOKED OKAY SO SHE SAID WE SHOULD GIVE IT A GO. WE HAVE SENT THEM THIRTY 29.95 POUNDS UK STERLING TO PAY FOR THE TICKET. I ALSO TOOK A COPY OF THE SAME BEFORE WE SENT IT BACK TO THEM WITH THE CHECK. IS THIS OR IS THIS NOT ONE OF THE CON JOBS THAT HAVE BEEN DONE TO PEOPLE, OR IS THIS ONE FOR REAL? Hesitant but optimistic from U.K.
View my Lottery Scam section. I also suggest that the only one getting fat is the organizer of the operation but should you win please consider buying a book despite my bad advice. Thank you for writing back so quickly. I found a web site for that last "scam?" I asked you about. My friend, who is actually my Homeopathic doctor has a web site about it. If you have a chance would you mind checking it out for me? Might even give you an idea for another chapter in a future book. The site is "Wealthfoundation.com" click on the "Step 5 International" then it will ask for a password and it is COGW0657. I am completely new to any of this and for some reason I've been approached with these two get rich quick schemes in the past few weeks. This one has me pretty confused. It would be wonderful if it was real and deep down I'm hoping it is, but I'd really like to get your opinion on it. You don't even know how great it feels to have somebody as fantastically brilliant as yourself (miracle grow head food) to ask these questions too. By the way I told my "Dinner Party" friend about your website and printed up a few pages for her. She thanks you too. I might even have to go down to the Tattered Cover and buy your book. 'Cause I'm a Believer! Firstly, I must congratulate you on a great site. I am writing from Australia, in regard to a California-based company called PrimeBuy Network.com. This would have to be one of the worst (..) ever. Typically participants pay around $US1000 to buy "an entrance to a shopping mall on the internet", but effectively they are buying the right to promote the opportunity to other participants. The participant gets a website with links to other merchant sites, and is supposedly paid a commission whenever goods are purchased via the participant's (or their downlines') website(s). But the real money is being made simply by the activity of recruiting. Your web site is great! Keep up the good work. Please add my URL to your searchable database of links: secure.fincrime.com Most fraud sites focus on the crime. Mine will try to help the victim start the recovery process. I have practiced law for over 40 years and tried a large number of civil fraud cases to judgment. I have yet to get the District Attorney of San Diego County to file criminal charges in any of my cases. Combined law enforcement spend billions of dollars on patrols for traffic tickets; smash, grab and run crimes; traffic accidents and the like. Very little money and time is spent tying to nab the financial criminal before his/her scam collapses. I hope that through my web site, I can develop a database of financial crimes which are "unreported" (reported, but cops refuse to write it up as a "case"), truly unreported, "reported" but not investigated, "reported" and "investigated" but not prosecuted, prosecuted but not convicted, "get-off-easy" plea bargains, and failure to order or obtain restitution through the criminal court process. This problem is probably endemic throughout the nation. It is time law enforcement and prosecutors change their priorities. It seems that the only financial crimes prosecuted by the local DA's are those in which governments, banks or politically well-connected persons and firms get ripped off. The average Joe does not seem to count. I want to change that. Thank you for having this web site! I just got hit with this again today, and it's prompted me to write, warning everyone about this telemarketing scam. Several years ago, I was working as an office manager for an architectural firm. One day I received a phone call from a guy who asked me if I could confirm the model number of the copier in my office. He acted very casual, as if he had been dealing with our company for years. Not knowing any better, I gave him the information. Shortly thereafter, boxes upon boxes of copier toner arrived at my office. My company has been the target of many of these scams - toner, advertising, and now a new one, supplies for our postage meter. Luckily, I have convinced everyone in the building that if they get calls regarding toner or copiers, light bulbs or packaging tape, anything that is being SOLD to us, to please transfer or refer that person to me. I like your website - it's very helpful. For more on Business Supply Scams go here. Paul Riker asks "Is this a scam or a money machine?" I have recently been offered an investment "opportunity" that sounds so good and so profitable that it boggles the mind. I wonder if you have heard anything of it. The deal is this: It is offered to me in the U.S. by a Canadian in Canada. I would invest $10,000 for a 24 week period. The money is piggybacked onto a $10 million dollar CD through a bank in the Bahamas (Horus Investment Bank). In 24 weeks my account would have over $100 thousand in it and I could draw on that money up to my original $10,000. That would be reinvested for another 24 week period. And so on. I would draw on the funds via a debit card or could set up an offshore trust that would reinvest in other entities if I wished. A check in the Bahamas shows no Horus Bank and when the offering party is asked about this he states that Horus is a private bank not registered with the Bahamian Government. The $10 million CD is used by the IMF for overseas investment in third world governments who repay in interest up to 600%. Have you ever heard of this one before? Your comments would be appreciated. What you have here is a classic Prime Bank Scheme in combination with an offshore trust along with an option on a Ponzi scheme when you withdraw funds. The principals involved in the Horus Services and Investment Bank scam are Canadians and they are all presently in Nassau where they hold banquets for new "clients". It seems that about 40 people attended a banquet hosted by Horus Services in Nassau in early August where they invested a minimum of $5,000 US. These clients appear to be the first layer of victims in the Ponzi scheme. They probably set up IBC's and opened offshore accounts while in Nassau and think that within 6 months they will use the IBC to conceal their newfound millionaire status. There are also likely to be other Horus clients that did not attend the banquet in August, or that have been recruited since. Word of mouth seems to be the predominant way this is spreading. Clients are supposed to accumulate the wealth upon maturation of the placement and completion of the associated "G1" education. The education has to do with strategies to achieve financial sovereignty. It is apparently $5,000 USD for the course and materials, minimum $5,000 USD for a placement. Clients are also eventually told they can't have access to their $ millions until they are taught how to spend it without attracting attention. There is also a nice hook for altruistic types as clients are told that 20% of their accumulating wealth, and that of other similar minded philanthropists, will be "donated" to the Amethyst Foundation and used to provide humanitarian relieve efforts around the world. Action in the Bahamas: Mechelle Albury, Compliance Manager of the Securities Commission of The Bahamas brussell@scb.gov.bs and Eva Etienne of the Central Bank of Bahamas eeetienne@centralbankbahamas.com have turned the matter over to the Police in the Bahamas because neither Horus Bank or Horus Services is a licensed entity under their Banks and Trust Company Regulations Act. No word yet back from Dorothy Cline of the investigation division of Canada Customs and Revenue Agency (250-363-0459) on what action her agency may take. Just came across your site while doing some research. I'm an attorney in Seattle involved in consumer fraud cases, several of them class actions. In fact, I handled the class action lawsuit your site refers to as "Nordic Trick" involving Mr. Calozza, the Sons of Norway insurance agent with the promissory note Ponzi scheme. Since that case, I have also been involved in lawsuits against campground membership resorts, resort membership resale businesses, travel clubs, video dating services, pyramid schemes, prime bank schemes, and other "businesses" listed on your site. There is a common thread that links many of these "membership" businesses. The consumer is sold a future service contract (membership) and told that they have three days in which to cancel. Actually, where there is a statutory cancellation period, the statute allows the consumer to cancel within 3 (or 7 or 10 depending on the statute) without paying ANY damages whatsoever. The 3-day period is a "super remedy" that doesn't allow the business to keep any money. After three days, normal contract damage law still applies. If the consumer hasn't caused $5,000 in damages, they are not obligated to pay a $5,000 sales price, or the business is not allowed to keep the full $5,000 if already paid. The business can only keep actual damages (for instance, the cost of a 1 hour sale pitch and a glossy brochure). Many consumers are really beat up with this misrepresentation. Many state Assistant AGs, and at least one FTC attorney, told me that after three days, that's it, you lose everything. I have yet to find a judge that agrees. Leisure Time Resorts of America (now Thousand Trails), paid out over $1,000,000.00 in consumer refunds in a class action lawsuit I finished last year. LTRA said the consumer had to pay the full sales price whether the consumer wanted to keep the membership or not. The judge disagreed, so consumers win. The court ruled that a business that requires full forfeiture on a future services contract has engaged in a deceptive trade practice. As a matter of common sense, the business has been relieved from performing years of membership services. Therefore, how can it be entitled to full payment? Nor does it make sense for the business to argue that the consumer should be forced to remain a member against their will. We are used to the concept of having to pay in full on a contract because we have driven the vehicle off the lot, taken the TV home, etc. When "you have the goods," you pay the price. When it's a future services contract, you only pay the damages (if any). I found from reviewing financial statements that the campground membership industry considers its satisfied customers as "loss leaders." The profit is in the ones who are disgusted with misrepresentations made at the point of sale, or move to Guam, etc., and simply walk away from their money because of the "no refund" language in the contract. I have found that the "dark underbelly" of many of the "business" type scams are seen only by the Office of the Attorney General. The police see the pigeon drop scams and the AGs see the Travel Club scams. Since there is no such thing as a valid pigeon drop business, the police are free to talk about it to the press. Unfortunately, the AGs are reluctant to provide too much information for fear of tarnishing the reputation of the "good" Travel Clubs (if any). Another area that doesn't get enough press is the successful individual consumer lawsuit. If an individual sues, proves a deceptive trade practice, and gets their money back, nobody really knows. Only appellate cases are reported so that other attorneys can find them, and a business is not likely to appeal and have everyone know that one of its business practices is deceptive. Consumers are constantly "reinventing the wheel" when it comes to proving that a particular business practice is illegal. I've been surprised at the number of "traditionally suspect businesses" (membership sales, furnace installers, dating services, etc.) who do not even show up to defend a lawsuit. They will pound their chests until the day of trial and then not show. Several weeks ago I had went to bed early, and the phone rang. I answered the phone and they said Mrs. Jones, I'm calling from the Gift Center to let you know, you have won a television valued at $179.00. I said I'm not interested. She said but don't you want to claim your television, all you have to do is verify your name and address. I said okay and said yes to her questions. She said we'll mail you a pink card to claim your prize. I said okay and hung up. Several days later I received another phone call from the gift center. She asked, did I receive my pink card, I said no. She said, I'm calling to set up an appointment for you to pick-up your television, and I'll send you another pink card. I asked her what was the value of the television? She said $179.00, and you also get a $40.00 gas voucher, and a $1000.00 bonus. It turns out to be a vacation park where you need to buy a membership to join. The gifts are conditional upon hearing a sales presentation. I attended one of the Skybiz seminars here in the PNG capital of Port Moresby last week. It was conducted by a Papua New Guinean man armed with a video of a seminar conducted by "the man who brought Skybiz into Australia". Participants at the seminar that night were exhorted to quickly go to the bank first thing the next morning and get a bank draft for US$125 (US$100 annual fee plus US$25 membership registration). That's a lot of money by ordinary Papua New Guinean standards ... even for professionals. Variations on the Nigerian Advance Fee Fraud submitted by viewers. For full details on how these scams, which offer to share millions with you, work go here.